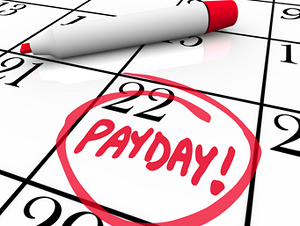 Pay day revolution on the way? A small but growing number of employers are experimenting with an alternative, earn-as-you-work approach. A pay day revolution could be on the way as a growing number of employers experiment with alternative salary systems that let workers access their cash as soon as they earn it. Abandoning the traditional structure of weekly, bi-weekly, or even monthly pay days, some employers are now are testing ways to give employees faster access to wages they’ve already accumulated. According to a report by The New York Times, Goodwill of Silicon Valley began testing a system eight months ago which lets workers withdraw up to half of the wages that they’ve already earned from their next paycheck, to a limit of $500. “When you have people living on the edge, very small things can cause a rapid acceleration into very bad conditions,” chief executive Michael Fox told the news outlet. More than half of Goodwill’s 300 eligible employees have used the option at least once. While the services that provide on-demand wages do charge fees every time a worker uses them, the cost is nothing compared to payday loans and could save employees from serious financial stress. In a time when financial stress is often cited as the leading worry for employees across multiple industries, the alternative approach could let employers help workers out without actually giving them a costly pay rise.